When automakers update a vehicle or give it a redesign and bring out a new generation model, they don’t always improve it enough to get the attention of the buyers they are trying to attract. 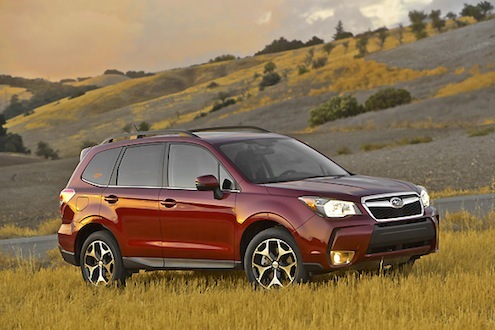 But Subaru hit a home run early in the season with the all-new fourth-generation 2014 Subaru Forester. The new Forester has just been launched in the U.S. and buyers are flocking to Subaru showrooms to buy the new crossover in record numbers. What did Subaru do to the 2014 model and how are buyers responding? Subaru changed everything from the ground up and gave mid-size SUV buyers what they want. And buyers responded in a big way in the month of April. April sales for the all-new 2014 Forester increased an incredible 65 percent over last years model for the same period in April 2012. Before, the previous-generation Forester wasn’t the brands best-selling vehicle. The Outback and Impreza have been the top sellers for Subaru until now. But Subaru knew they had to compete with the new Toyota RAV4, Honda CR-V and Mazda CX-5. So they went to the drawing board and improved everything on the Forester. Recent commercials show families utilizing the new bigger back seat and it’s getting the attention of a new generation of buyers who have never purchased the brand before. Subaru has moved into the mainstream of buyers looking for a mid-size SUV for their family. Imagine an SUV with all-wheel-drive, that offers superior weight balance and maneuverability and has the ride comfort of a sedan. That is what Subaru engineers and the design team set out to accomplish when they redesigned the new 2014 Forester. The design team, led by Project General Manager Takuji Dai, had a goal to boost overall ride comfort and stability of the crossover at high speeds and in the corners. Repeated runs by test drivers in various track conditions at the Fuji Speedway, helped Subaru reach their goals. The all-new new 2014 Subaru Forester offers mid-size SUV buyers superior ride comfort, weight balance, maneuverability and offers fuel economy at the top of its class. Forester performs well in all conditions from city streets, highways and back country dirt roads. Subaru hit a home run and it’s showing up with buyers responding here in the U.S.
Watch the 4th-generation Forester development video chapter 2 below.